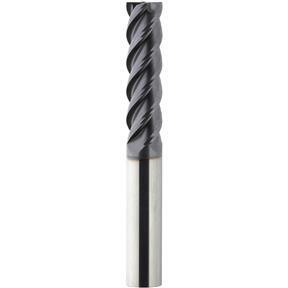 This 4-flute Micro Grain Carbide End Mill will give you stable cutting action and faster feed rates. And with the TiALN coating you can expect durability that far exceeds HSS or uncoated carbides many times over! The end is ground for plunging or 3 axis ramping of any kind.Cutting Diameter: 1/8"Shank Diameter: 1/4"Cutting Length: 1/2"Overall Length: 2 1/2"